UrbanCompass is an elegant navigation app for the iPhone 3GS. The app from The Good Life helps you find nearby businesses, and then guides you to them. And it does a fine job. 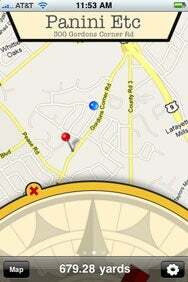 Show Me the Way: UrbanCompass uses the navigation features in the iPhone 3GS to help you find nearby businesses and addresses. When you first launch the app, you’re presented with a close-up view of a compass against a lovely, wood-grained background. The compass appears to be pointing you to UrbanCompass’s one built-in location: The North Pole. I stared at this screen for moment, sizing up just what I was supposed to do next. On a lark, I swiped across the compass—and it moved! Its movement revealed a lengthy, needlessly-ornate list of business types to search for: banks, bars, coffee shops, and the like. A small green arrow on the compass pointed the way to go. As I moved, the compass updated instantly, nudging me left and right as needed. It worked flawlessly, and guided me accurately to my destination. By default, UrbanCompass keeps the compass against that wood background. Tapping the Map button, though, brings up a decidedly useful hybrid map/compass view. Disappointingly, UrbanCompass doesn’t integrate with your address book, so you can’t use it to easily get directions to friends and businesses you’ve already programmed into your iPhone. On the plus side, a recent update to the app resolved a previously troublesome bug; now, in addition to searching by business type, you can also tap in any street address for navigation. One other small grievance I have with UrbanCompass: The app allows you to e-mail your pals your current exact location. But the link included in the e-mail it sends can only be opened by other iPhone wielders who’ve installed UrbanCompass themselves. Intrepid geeks might do some spelunking on the link itself to discover your precise latitudinal and longitudinal coordinates, but the app should make that process simpler. Overall, UrbanCompass looks very nice, and it works impressively well. If you frequent metropolitan areas, the app will do a great job finding nearby businesses and guiding you toward them. Once the app supports free-form address finding, it will merit even more praise.